​The DR Graphic paperless recorder reliably records electronic data in a secure format from directly connected sensors or transmitters that can be used for documentation of process conditions and process improvement. It is designed to easily replace Circular Chart Paper recorders; the similar cutout dimensions and its shallow depth make it easy to fit the new recorder into the existing panel space previously occupied by a paper circular chart recorder. 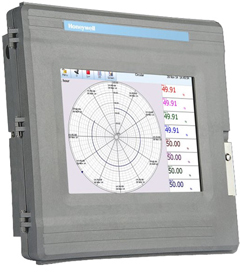 Its large 12.1” diagonal high-resolution display provides the best solution for viewing and monitoring process data, while the 16-analog input capabilities provide the means to monitor all critical and most secondary parameters in a given process.